D'varim/Deuteronomy 5:4 Face to face to the L-rd spoke with you on the mountain, from the midst of the fire. Hirsch suggests that these words seem to express an even greater directness, without any intermediary, than the more frequently used (e.g. B'rehseet 32:30, Shemot 33:11, D'varim 34:10). He explains that, "the Presence is not only turned one to the other, but it penetrates into the other; through the Presence, the Mind of the one communes with the mind of the other" and compares these words to the similar expression - literally "eye in eye" - translated "in clear sight" (B'Midbar 14:14, JPS). The closeness or intimacy is confirmed by , "with you", rather than "to you" which might have been expected: HaShem spoke with the people, not to them. Targum Onkelos is horrified by what it sees as "the impossible notion that G-d has a human-like face" (Drazin and Wagner so replaces the whole phrase , "face to face He spoke" with the less anthropomorphic "speech with speech He spoke". This retains a surprising level of intimacy, but moves from sight and seeing to speech and conversation. 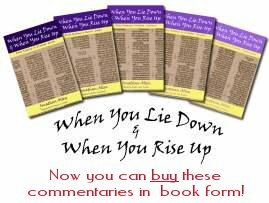 Richard Elliott Friedman tackles the same problem in a different way: "Just a short time earlier Moshe had said, 'You didn't see any form in the day that YHVH spoke to you at Horeb from inside the fire.' But now he says, 'Face-to-face, YHVH spoke with you at the the mountain from inside the fire.' This is further confirmation that 'face-to-face' is not a literal expression. Like many Hebrew expressions involving the word 'face', it is an idiom. It is used metaphorically to mean direct, personal communication, not mediated by any third party." Friedman changes it to a metaphor, rather than a literal report. The ancient rabbis saw many compelling illustrations in this verse, some of which are collected in (Pesikta Rabbati 21.6). In the first, "Rabbi Johanan said: A statue - a thousand men look at it, each every one of whom says 'It is looking at me'. Even so the Holy One, blessed be He, made each and every man in Israel feel that he was looking at him, saying, I am the L-rd your G-d." In another, "Rabbi Phinehas taught in the name of Rabbi Joshua ben Levi: Consider the analogy of a mighty warrior who whirls his sword about and makes it face in all directions one after the other." These deal with the physical aspect of everyone seeing the same thing at the same time. It is the same image, just spread or shared with many people. In a different approach, "Rabbi Levi said: G-d faced them in many guises. To one He appeared standing, and to one seated; to one as a young man, and to one as an old man. How is this so? When He appeared at the Reed Sea to defeat the Egyptians, He appeared as a young man, since was is waged best by a young man as it is said: The L-rd is a man of war, the L-rd is His name (Shemot 15:3). But when He appeared at Sinai to give the Torah to Israel, He appeared as an old man, for Torah is at its best coming from the mouth of an old man as it says: With aged men is wisdom, and understanding in the length of days (Job 12:12) and Daniel reported: I beheld till thrones were places, and one that was the Ancient of days did sit (Daniel 7:9)." This focuses on HaShem's attributes, in the way that He could be imagined in different stances and appearance. In yet another approach, "Rabbi Levi taught: At Sinai the Holy One, blessed be He, appeared to them with many faces, with a threatening face, with a severe face, with an angry face, with a joyous face, with a laughing face, and with a friendly face. How is this so? When He showed them the punishment of the wicked, He showed it to them with a threatening face, with a severe face, with an angry face. And when he showed them the reward of the righteous in the time-to-come, He showed it to them with a joyous face, with a laughing face, with a friendly face." This directly uses the idea of multiple faces, to imagine how HaShem would have looked as He was giving the Torah with its blessings and curses, with its rewards and punishments. The best place to start pulling this together with our faith in Yeshua is the well-known verse from the start of the letter to the Hebrews: "This Son is the radiance of the Sh'khinah, the very expression of G-d's essence" (Hebrews 1:3, CJB) or, as the ESV presents it: "He is the radiance of the glory of G-d and the exact imprint of His nature". When we look at Yeshua, we see a perfect representation of G-d. Yet this was hidden from those who could not believe in G-d: "In their case the god of this world has blinded the minds of the unbelievers, to keep them from seeing the light of the gospel of the glory of Messiah, who is the image of G-d" (2 Corinthians 4:4, ESV); the enemy has managed to stop the obvious being visible to many. How did Yeshua look? History has been very careful - and consistent with the commandment, "You shall not make for yourself a sculptured image, any likeness of what is in the heavens above, or on the earth below, or in the waters below the earth" (D'varim 5:8, JPS) - to leave us no authentic physical representation of Yeshua: no busts, statues or pictures; the Scriptures and the early church writings contain no descriptions of his appearance or physique. We should assume that he had dark hair and eyes, an overall sallow or olive eastern Mediterranean skin colour and that his hands - after thirty years of rough carpentry and stone work, earning a living for himself and his family - would have been somewhat chipped and blistered; all very typical of His time and era. His appearance merited no particular attention or comment from His detractors: Herod, Pilate, Caiaphas and the Sanhedrin, the Pharisees. He was clearly seen by many individuals and the crowds - Jairus and his wife, the Syro-phoenecian woman, the members of the synagogue in Nazareth, Nicodemus - yet again, all without a single comment or exclamation about His appearance. The single exception is the record of the transfiguration: "His face shone like the sun, and His clothes became white as light" (Matthew 17:2, ESV), but this is remarkable - in this context - not by His transfigured appearance but by the complete absence of comment about His before and after appearance; nothing apart from, "Yeshua was alone once more" (Luke 9:36, CJB). That said, the disciples left no doubt that they had seen something quite remarkable. Here is John: "The Word, which gives life! He existed from the beginning. We have heard Him, we have seen Him with our eyes, we have contemplated Him, we have touched Him with our hands!" (1 John 1:1, CJB). This is very ordinary physical contact, in just the same way as we nudge and bang people in crowds, in supermarket queues; when we watch people walking down the High Street, waiting to catch a train or buying flowers; when you reach out your hand to stop someone crossing the road in front of a car they haven't seen. But at the same time, John's language suggests a lot more than otherwise: "The life appeared, and we have seen it. We are testifying to it and announcing it to you - eternal life! He was with the Father, and He appeared to us" (v. 2, CJB). This is not just, "I met the accountant for lunch today", there is a qualitative difference: eternal life! And John writes to make sure that we know and understand what he is saying; this is not a spiritual or metaphorical experience, this a strong and personal experience shared so that we my believe it: "What we have seen and heard, we are proclaiming to you; so that you too may have fellowship with us. Our fellowship is with the Father and with His Son, Yeshua the Messiah" (v. 3, CJB). Yeshua ate and drank with friends: "Six days before the Passover, Yeshua therefore came to Bethany ... So they gave a dinner for Him there. Martha served, and Lazarus was one of those reclining with Him at table" (John 12:1-2, ESV); it is unimaginable that there wasn't laughter and conversation over the meal. Yeshua went to the wedding at Cana (John 2:1-12); weddings were times of joy and celebration. At the other end of the emotional spectrum, when Yeshua came to Bethany after Lazarus had died, He wept visibly (John 11:35-36) so that others commented. The writer to the Hebrews explains, "It was essential that he should in this way be made completely like his brothers so that he could become a compassionate and trustworthy high priest for their relationship to God" (Hebrews 2:17, NJB). Because He is like us in every way - "yet without sin" (4:15) - He has spoken to us face-to-face, having walked more than a mile in our shoes and having faced the heat of the same fires that we face every day. Application: Have you looked Yeshua in the face recently, eye-to-eye, face-to-face? G-d is seeking that level of intimacy with us today as well as in Bible times and is calling us to engage with Him. Are you missing out?